Although she has no biological offspring of her own, Madu is a proven mother with an outstanding track record for rearing her three foster sons: Remy, 4; Dumadi, 8; and Bernas, 13. Bernas now resides at the Denver Zoo. With her three previous foster infants, Madu was trained to bring an infant forward to receive regular bottle feedings from human caregivers, providing all other aspects of maternal care herself. Orangutans have longer childhoods than do any other terrestrial mammal species with the exception of humans. The opportunity to be reared by a fellow orangutan is essential to the development of the young, who learn everything they know from their mothers. In the wild, these skills include knowledge of climbing safety, appropriate predator avoidance behaviors, the ability to identify and remember the locations of fruiting trees and the ability to discern the appropriateness of certain fruits and other foods. 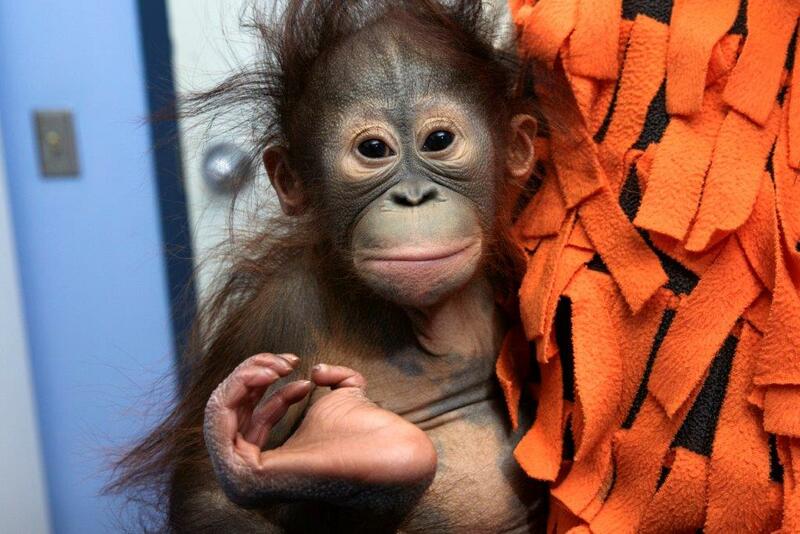 Bornean orangutans can be distinguished from Sumatran orangutans by their darker hair and skin. While the Bornean apes outnumber their Sumatran counterparts in the wild, both species are endangered and are experiencing dramatic population declines as a result of habitat loss, over-harvesting of timber for palm oil plantations, and human encroachment. Experts predict that Sumatran orangutans could be extinct within 10 years without targeted conservation efforts. Zoo Atlanta houses the largest zoological collection of great apes in the U.S., including 20 gorillas, and is now home to 12 orangutans ranging in age from Keju to the Zoo’s senior orangutan, 45-year-old Biji. Madu and Keju will have an opportunity to bond behind-the-scenes before meeting Members and guests. Stay tuned for updates on their introductions and for news on when Members and guests will be able to see the new arrival.